There is nothing like an unfulfilling job to make your life miserable, right? Well, unfortunately, most people have to decide what they will do for a living at a very young age and more often than not, they don’t choose wisely. The traditional path tells us to pick an endeavour at an age at which we are to young to even buy beer and forever ponder how things would have turned out had we chosen a different path. Maybe that’s not you. Maybe for a long time you were satisfied with your career, but you see that things have run their course and you want a change, a challenge, the excitement of a slightly different job? Maybe you just don’t want to work 9-5 in an office anymore? Many people stay stuck at jobs they no longer feel passionate about because they feel “too old” to start again. But hey, if you’re 50, you still have 17 years of work until retirement, why not spend that time doing something you love? If you stick with us, we will compendiously give you the best information on why and how to make a career change at 50. Like anything worthwhile, making such a change can sometimes be hard. Maybe you have debt, maybe a mortgage, but maybe you also have some money saved up? Use it wisely and embark on a new life-journey, knowing that if done well, a career change shouldn’t feel like a long, exhausting process. The key word here is planning. Plan how you’re going to spread your remaining funds until your new career turns into an income. Plan how you will turn it into an income in the first place. Plan how you want your new day to work. For those who want to go freelance, plan how many hours a day you want to work. Plan where in the house can you put a small work desk or what other place would be suitable in your house, if you want to work from home. Plan what coworking space you could use if you don’t want to work from your house. What are you really good at? What kind of work and work environment would suit your current situation? There are many organizations that will help you reevaluate your skills for a small fee or even for free. There are many amazing tests that will help you find your strengths and weaknesses online and they too cost next to nothing (they are often free). We don’t necessarily mean that you literally need to go back to school, even though that is also an option for some. But making a career change definitely involves some learning. There are a lot of organizations who help people change careers and they often offer some free courses. You could read books on subjects such as IT or sales, or you could just apply for many free or dirt cheap online classes. Did you know there are tutorials and classes for almost anything on YouTube? In today’s world and job market, very few skills are in demand like IT skills are. To make a career change at age 50 will for most mean that they will have to brush up their computer skills. Again, there are a lot of online courses and video tutorials on anything that could potentially confuse you or on how to use certain programs that you might necessarily have to work on once you get a new job. Even some ivy league colleges offer free online courses, like Harvard! Once you got your assessment and you know what to work on, don’t hesitate! Did your contacts get a little stale? Do you go to the same bar every week and hang out with the same few people every week? Well, if you want to take this big leap, it’s time to take another look at your rolodex and build more connections! If you know someone that works in your field of interest, take them for a drink and ask for some tips. When embarking on a new career path, many feel anxious about writing their new resume and cover letter and end up feeling a little discouraged, but that’s alright. It’s not too late to make a new career choice but it is too late to procrastinate. If you feel awkward about the fact that you are applying for one job when it says on your resume that you’ve done another for 25 years, we understand, which is why you should write a killer cover letter. In that cover letter, you should strive to emphasize your transferable skills rather than the ones that were tied exclusively to your previous career. For example, if you used to be in sales and now you want a job in HR, mentioning you are friendly, agreeable and insightful might be better than highlighting how convincing you can be. Your resume should also feature any exceptional achievements you’ve had at your old job and telling why you applied for that particular company is never a bad idea - show them you feel passionate about what they do and convince them that you might improve their business with your hard work, different perspective and willingness to learn and adjust. Use job networks such as Linkedin and AngeList to find work, but also make yourself accessible to companies who might be looking for professionals like you! If you still find this process daunting, just think how daunting it would be to spend the rest of your life stuck in an office doing something you don’t find satisfying, living a lifestyle you outgrown. It’s time for some inspiration from those who made a fortune later in life. Harland David Sanders did not have the easiest of lives - he lost his father at an early age, only to get a step-father he fought with most of the time. He switched from a lot of jobs, working as a steam engine stoker, filling station operator and an insurance salesman. The Colonel, whose ranking was honorary, not military, gained popularity for his delicious chicken recipe while working at a service station, that later burned down, and which he had rebuilt as a motel and a 140 seat restaurant. That’s the story of the first KFC, that Harland David Sanders founded in 1952., when he himself was 62 years of age. Today it is estimated that Kentucky Fried Chicken is worth almost 16 billion USD. When you are a 52 year-old broke, depressed and divorced woman, many would think millions are not in your cards. In Carol’s case, they would be wrong. Carol’s therapist advised her to get a dog, and when she did, she won on a local Christmas card contest with a picture of her dog and a funny quip. The win inspired Carol to make a card company and name it after her dog - Zelda. Zelda Wisdom is today worth 50 million USD. Before writing her first cookbook at age 50 and become a world-known celebrity chef, Julia worked in media and advertising. Not only did she switch careers at 50, she was a terrible cook well into her 30s and fed herself frozen dinners every night, because previous attempts at cooking resulted in an oven fire. That “terrible cook” worked herself to become the first woman inducted to the culinary institute of America’s Hall Of Fame. Doesn’t their last name sound kinda familiar? Tim and Nina Zagat were 51 year-old lawyers when they published their first collection of restaurant reviews. One could say it was a silly idea to quit law to write restaurant reviews, but today Zagat is worth 200 million. Before buying McDonalds and turning it into the largest global fast-food chain at 52 years old, Ray Kroc worked as a milkshake device engineer. He is known for accumulating a massive amount of wealth, but also for his various creative business ideas. When at 72 he decided to retire from running the McDonalds franchise, Ray made another career change - he bought a baseball team, the San Diego Padres. Inspired for change? Good! Now we can continue guiding you through your new path. If you want a different career path, now is the time to start and we’re here to help. 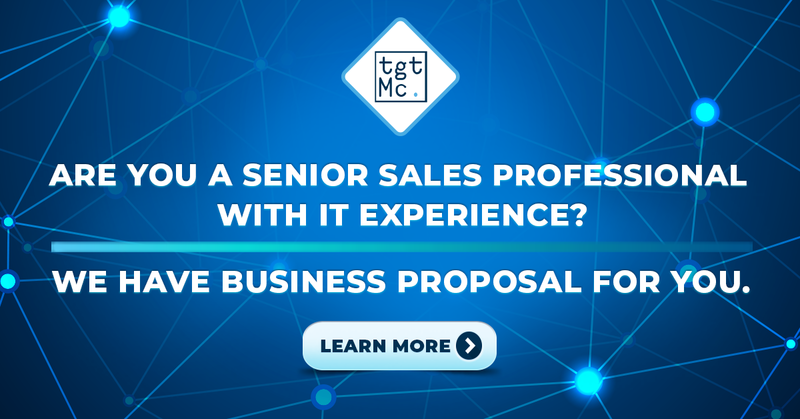 TGTMC is a platform that connects seasoned sales professionals to small and medium sized companies, as well as startups, giving senior sales professional a new, more entrepreneurial strength. Together we can fight the ageism senior professionals unfortunately encounter in the job hunt and build new opportunities to mutual satisfaction. At The Go To Market Company we believe youth is a state of mind and everybody deserves to be treated fairly and given the opportunity to shine. Join us and make money on the hard earned skills you acquired by taking a more entrepreneurial approach and forget about the traditional job search. It’s never too late to start the best chapter!